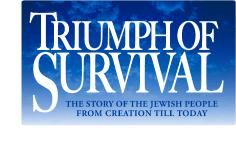 Based on his highly successful audio series on Jewish History (over one million lectures have been distributed world-wide), Berel Wein and Destiny have begun production on a new video and audio series entitled Triumph of Survival. The Story of the Jewish People from Creation until Today. Triumph of Survival is planned to be a 120 part series – produced in 10 lecture segments. Each segment will be available in video, audio and text formats. The first segment is slated for release at the end of April 2010. The series is being filmed before a live audience in Jerusalem, at the Hanassi Synagogue, Rechavia – on select Saturday nights. Tickets will be available at the door. Call Miriam Cubac 052-833-9560 for schedule and time. The Claims Conference, The Conference on Jewish Material Claims against Germany, has approved a grant to the Destiny Foundation for the production of its multi-media educational programming and films on the Holocaust. Ominous Skies – The years covering the pre-World War II and Holocaust years 1930 – 1939. The Darkest Days – The years covering World War II and the Holocaust 1939 – 1945. When the Claims Conference began receiving proceeds from the sales of unclaimed Jewish property that it recovered in the former East Germany, the Board of Directors made a decision to allocate up to 20 percent of the funds toward research, documentation, and education of the Shoah. The board made this decision out of a sense of obligation to preserve the memory of the six million killed, in order that the world does not forget both how they lived and how they died. Through its contributions to leading institutions that have expertise in Holocaust research, education, and documentation, the Claims Conference also seeks to help ensure that future generations learn of the Holocaust. As the Shoah recedes from memory to history, it is crucial that future generations have available the records, photos, and other materials that institutions are still able to assemble today. It is also crucial that the history of the Holocaust is preserved and presented in a way that is meaningful and accessible to generations who will not be able to meet survivors firsthand. An Educational Professional Advisory Committee and a Research and Documentation Professional Advisory Committee, comprising experts in their respective fields, review all applications for funding. Professor Yehuda Bauer, Professor Emeritus of History and Holocaust Studies at the Harman Institute of Contemporary Jewry, Hebrew University of Jerusalem and academic advisor to the Yad Vashem Foundation. Professor Dan Michman, Professor of Modern Jewish History at Bar-Ilan University. Dr Deborah Esther Lipstadt, Ph.D., Dorot Professor of Modern Jewish and Holocaust Studies at Emory University, Atlanta. Dr. Kiril Feferman, Ph.D., Head of projects on “The Holocaust in the Occupied Soviet Territories”, Yad Vashem, Jerusalem. Dr Monty Penkower, Emeritus Professor and Chairman, Dept. of History, Touro College Machon Lander Graduate School of Jewish Studies, Jerusalem. Dr Zvi Gitelman, Professor of Political Science, and Preston R. Tisch, Profesor of Judaic Studies, University of Michigan. Dr Jeffrey Gurock, Libby M. Klapeman Professor of Jewish History, Yeshiva University, New York. Dr Jane S. Gerber, Professor of Jewish History and the Director of the Institute for Sephardic Studies at City University of New York. Dr Anita Shapira, Ph.D., Professor Dept of Jewish History, and the Ruben Merenfeld Chair on the Study of Zionism, Tel Aviv University. What does West Point, Andrews’ Airforce Base, 35 JCC’s and over 350 Jewish schools have in common?